You can find Laura’s articles here. Her website is here. Recommended: Yes, it will help parents to coach their kids of any age. It contains well researched steps on how to coach a child and will be suitable not only to develop initial interest in chess, but will also help coach children who are already playing chess to sharpen their skills. The plus point, even a parent who has no prior knowledge of chess, can pick up this book and begin to coach. Whether or not, chess originated in India, it has definitely shot into popularity again, thanks largely to Anand Viswanathan, our very own grandmaster. Help is at hand. Laura Sherman, who was once one of the top 50 women chess players in the United States and a Mum, who taught her son how to play chess when he was as young as four, soon to be joined by his two year old sibling, has co-authored a book with Bill Kilpatrick: Chess is Child’s Play – Teaching Techniques that Work. Co-author Bill Kilpatrick is a serial entrepreneur and among his various diverse interests chess coaching is one of them. At high school, he coached his own team and they swiftly rose from being the underdogs to winning the Florida State, and Southeastern US Championships. 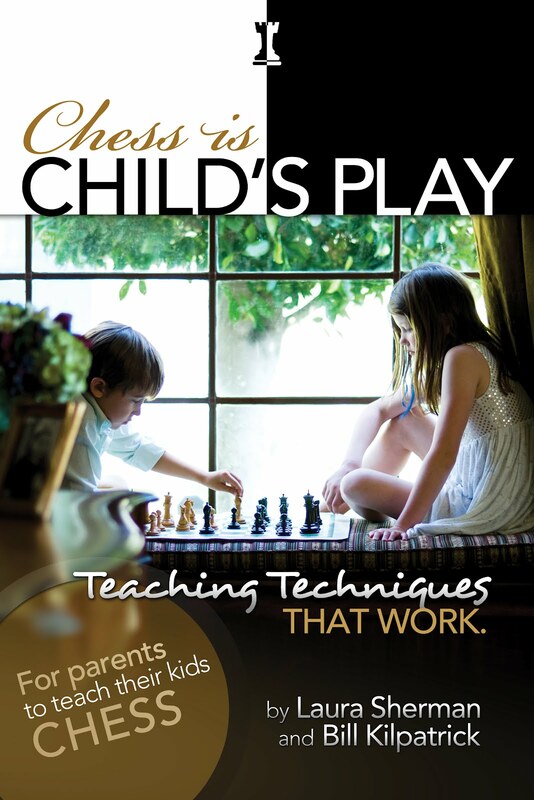 The technique of teaching chess has been perfected by both authors over the years, and any parent, who doesn’t even have any prior knowledge of chess, can pick up this book and begin to coach his or her child. Instructions have been provided in a step by step manner. Yes, children are apt to fidget and be fussy about sitting before a chess board; this is where the book comes in. It will teach any parent or grand-parent how to make chess more interesting and have their child or grandchild hankering for yet another lesson. There is perhaps no better way to bond, than a game of chess. Laura has put into words what she has actually done. In addition to teaching her own kids how to play chess, she and her husband started their own chess coaching business a few years ago, where they have partnered with a few local schools in the US and are teaching kids of all ages. She is truly passionate about chess. Her own foray into chess began at the age of nine. Laura says: “My father taught me to play chess when I was nine. He was a postal chess player, with chess boards set up all around the living room. He’d wait for weeks, sometimes months for a move to arrive from Russia. It was exciting to me and I wanted to learn. I remember the night that I beat him. It was a thrill. The next day he suggested that I take lessons from a Russian master, so that really began my adventure”. Since I was much intrigued by this book, I decided to reach out to Laura. Laura Sherman, agreed to participate in an e-mail interview, to tell us more about chess and this book. 1)Children lead a very hectic schedule these days, they are forever attending some coaching class or the other and are cooped indoors. With the little time they have parents may prefer their opting for an outdoor sport, thus why do you think chess is important? I think it is important to encourage your child to do many different kinds of extra-curricular activities. I would never promote chess over football, music or oil painting, but would strongly suggest providing opportunities for all activities. When I began teaching my son, I would bring the chess set outdoors with me. We live near the ocean and so I would take him for a good vigorous swim before our lessons. Our lessons were always fun and he made quick progress. 2)At what age can a child be introduced to Chess? Is there any optimum age for introduction to chess? Children can begin learning some aspect of the game at any age. By the time they are four they are usually ready to learn the entire game. However every child is different and it is important not to push chess on a child who isn’t ready. Some children learn before they are two and some learn when they are much older. In Chess Is Child’s Play I propose to gently try to teach a child and if it doesn’t take, wait and try again in a few months. 3)What advice would you give to parents who are intimidated by chess and yet want to have a role to play in coaching their kids? Bill Kilpatrick and I wrote Chess Is Child’s Play considering the parent who might be intimidated by chess. We designed the book to teach the parent while teaching them to teach their child. Someone who is expert in chess will still receive many tips on how to teach a young child, but the parent who is new to the game will learn how to play. I find that most people want to learn chess, but feel they must be a genius to learn. This isn’t true. The fact is the chess creates geniuses! Just this morning, as I was writing my answers to you, I received this email from a mother in NY. "Your book transformed me. For 41 years I was afraid to learn chess, and in reading and learning from your book, I was able to teach myself AND my 5-year old son. We play all the time, our brains are working and I am proud to finally understand this refined and incredible game. THANK YOU for your incredibly accessible, fun, and super-practical instruction." She, and the million other moms and dads like her are why Bill and I wrote this book. Anyone can learn to play chess! 4)Do you think it is best that each child is coached solo or should siblings be coached together? That’s a good question! We do address this in the book. The answer is simply that it depends on the children. Some children do well together, while others do not. It is important to make sure that if one child is moving faster than the other, the faster one receives additional lessons, so that they aren’t penalized for moving quickly. Another idea is to have two older children possibly teach each other to play, using the exercises together to learn. There are a few books that parents can give to a child to help them learn to play child. Chess Is Child’s Play is different. We teach the teacher to teach! The book is not designed to hand over to a child, but rather is structured to give the parent a complete guide to teach the fundamentals of chess to their children. It turns the parent into a chess coach! We also wanted to make sure the parent could learn along with their child. For that reason we really broke down all the basics into baby steps. For instance, many people wouldn’t consider that a young child needs to learn how to physically take one piece with another. How do you do so with proper form? We go over that, giving the parent exact instructions on this point. This might seem like a minor point, but believe me, getting this grooved in properly from that start is important! In addition we firmly believe that real life analogies are key to helping a child understand the lessons. 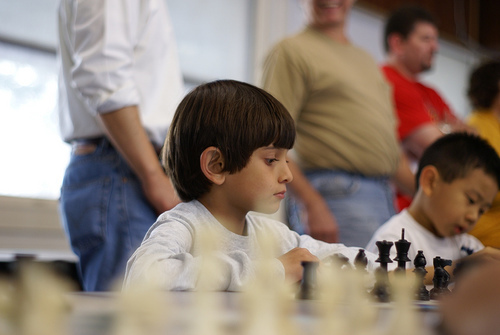 The more you can relate the concepts of chess to life, the easier it will be for the child to apply them to the game. And then, as they learn the lessons over the board, the children will apply the principles to their lives. 6)Any plans of an e-book or audio book? Yes, we do plan to create an e-book down the line. It is a bit challenging as there are a lot of graphic pieces to this book, which are instrumental to its structure and style. We don’t want these to get lost in an e-book format. What are you waiting for? Go on, get this book. It is perfect for the summer holidays and beyond. The post is very nice. My daughter can play chess. But, I can't find the patience for the game. Chess is definitely a game of mind. I heard, people who play chess are good in Math too. I found your website after doing a google search for this book. I am posting my review on the book tomorrow, and linking back here to your interview with Laura. Thank you for sharing your reviews! @Sonya: Thanks for the link back. Look forward to your review.